Last year Andy Dickinson made research about how newspapers worked with video. He says that most of the answers came from US, but anyway I think the results are remarkable but also useful. 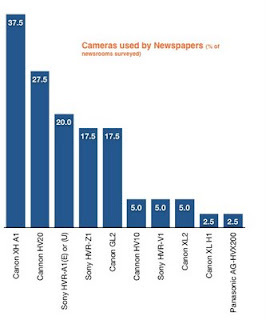 It shows that Canon HDV cameras is far most used and editing wise Final Cut is a clear leader. Avid, Premiere Pro and Movie Maker have the same marked share but comes at number four after three Apple products. Andy also asked how much time and footage on tape video journalists spent on daily bases. Check out the results in detail here. Lagt inn av Bloggerguy kl. 2:10 p.m.